You guys, I was watching Trading Spaces the other night and it was down right SCARY. I’m not kidding, they painted someone’s bedroom in four different colors. It was pink, yellow, blue, and green. Even the furniture was painted to correspond with each color in the room. It was basically like a rainbow exploded. To each their own I guess, but EEESH. That room would stress me out. Anyway, enough about that–let’s move on to more relaxing things! 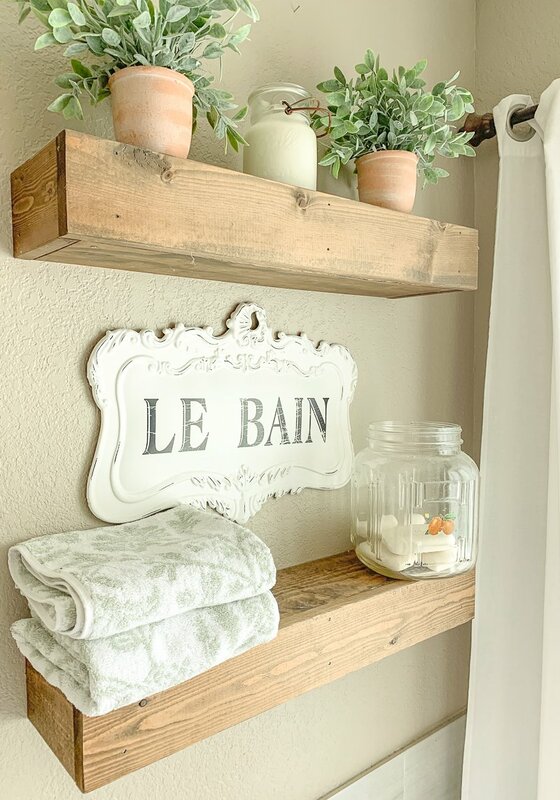 I wanted to share a simple little bathroom refresh with you guys today, along with a DIY bathtub tray I made recently. So I made that little bathtub tray recently and it was SO darn easy. I just measured the length of the bathtub, cut a piece of pine to length, and then I used chalky spray paint to paint it white. I finished it off with a little distressing and a topcoat of the chalky matte clear wax finish to seal it. Then I screwed two handles on each side (from Hobby Lobby) and that was it. Easiest tray ever. This little tray was seriously so quick and now I’m wondering why I didn’t make one a long time ago. 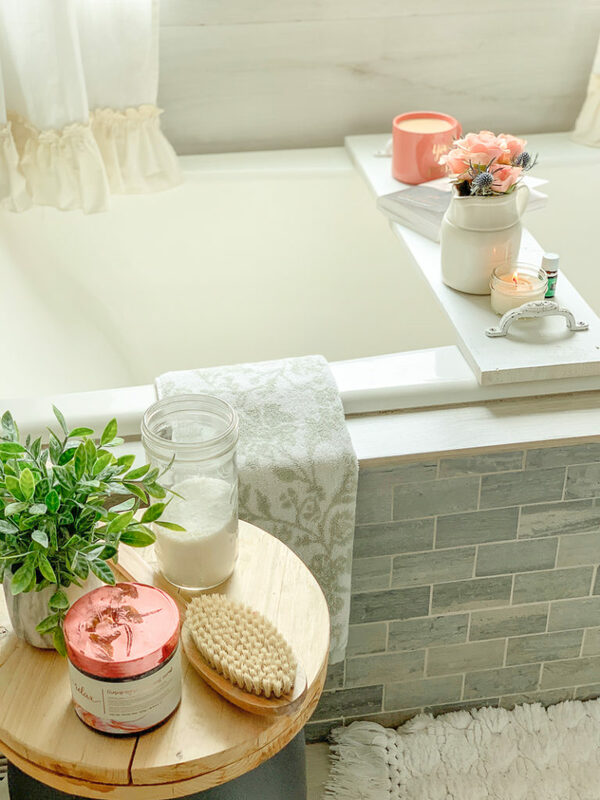 I love using it when I’m soaking in the tub–it’s perfect for holding my book, candle, etc. It even works well for chocolate cake. You know, if you’re into that kind of thing. And on an unrelated note, I’ve been loving two drops of Peace & Calming essential oil in the bath to help me unwind. SO GOOD. I like to keep these shelves pretty simple–just a few extra towels and a little greenery. And I always keep extra soap in an old jar. My father in law actually made these floating shelves, but Target carries some that are very similar. 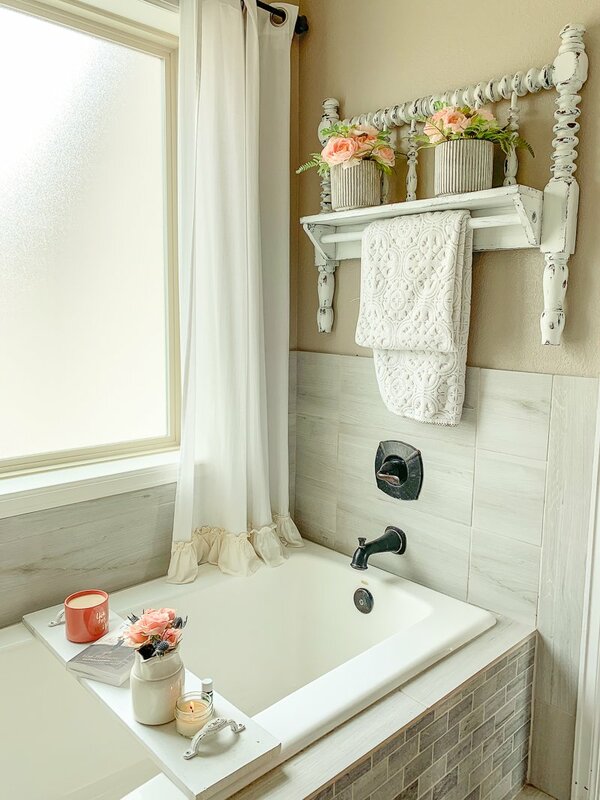 If you’ve been around for a while you might remember that DIY towel rack I made from an old bed frame. Isn’t it cute?! I actually still use it and it’s one of my favorite DIYs ever. Thank-you for inspiring me to do a redo in my bathroom. Have a beautiful day! First, I am new to your blog (past few months) and I have to say how much I am LOVING it!! You’ve added so great finds to your home, and they’ve found their way into my home as well. 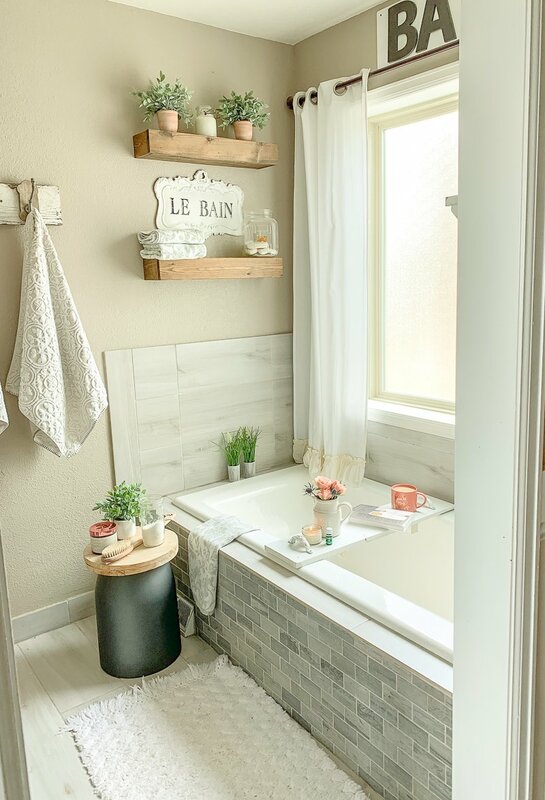 The little table next to your tub is adorable. Can you tell me if that’s an original or if you bought that somewhere? Thanks for all the great ideas and photos! Happy blogging…. Thank you so much Rachel!! So happy you found me 🙂 And that little tray is actually from Marshall’s last summer. Wish I had a link for you! thank you sweet Becky, happy Wednesday! Oh yeah!! I actually forgot that I made that towel rack Melissa. 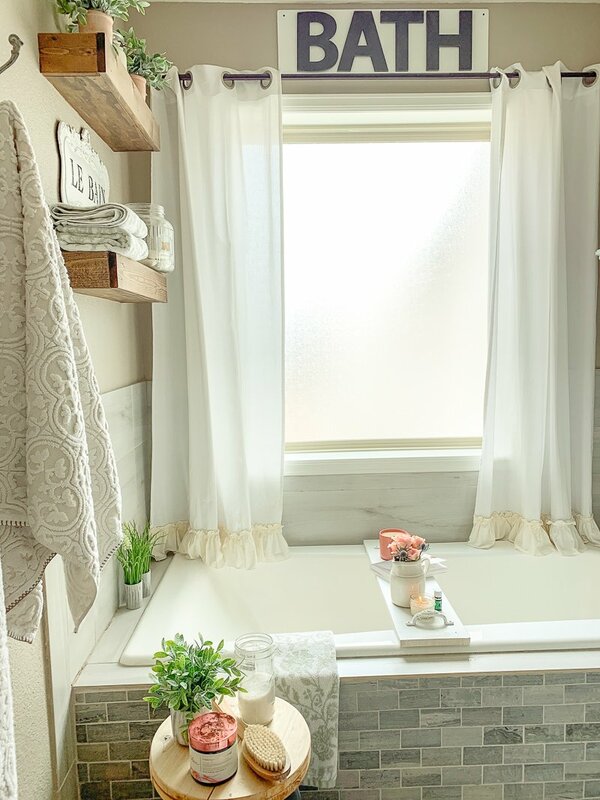 So many DIY’s in this bathroom, I can’t keep track! Hello, I really enjoy following you. Where did you get the handles for the board? Hi Carol, they’re from Hobby Lobby! Do you have to attach the two boards across the bottom of the tub tray? Are they for support? Love your inspirations!! You are SO talented! Thanks for sharing. Ah thank you Dee, you are so sweet! And those boards on the bottom are to help it from sliding on the top, but clearly I put them too far out. They needed to be closer to the edge! 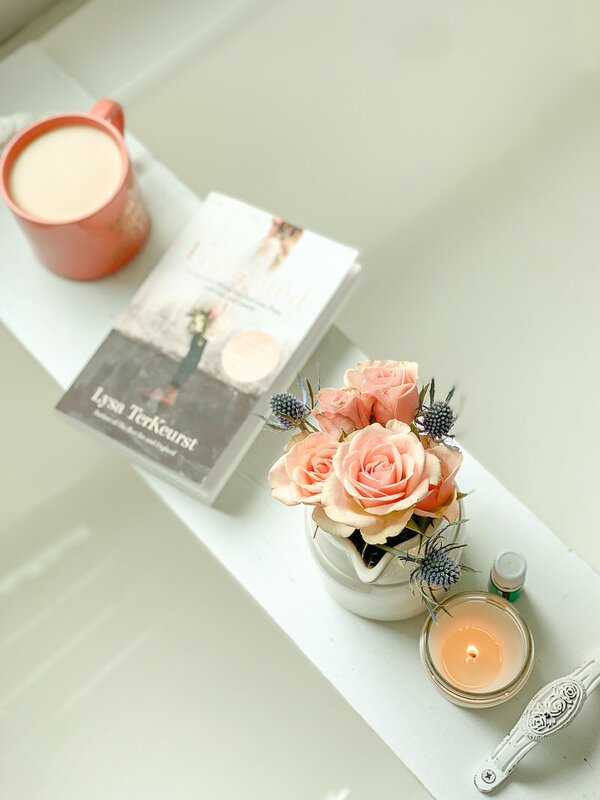 Sarah, I love this tray idea! I think it would make the perfect gift for mothers day or a sister or girlfriends birthday! 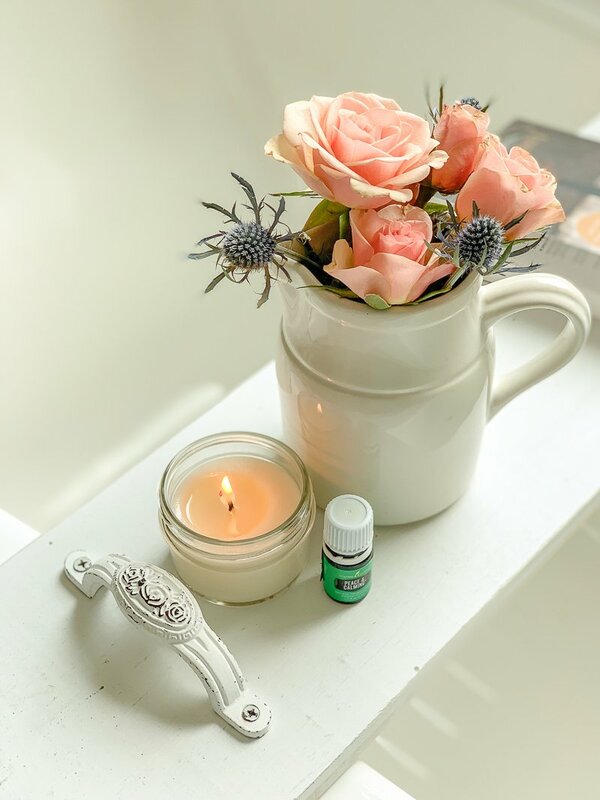 I think I’ll have to try this and gift it with some of my fave EO and some florals…it would be so pretty wrapped up! Oh that’s a really good idea Dena!! It’s seriously the easiest thing ever. Hi, just wondering. I am going to chalk paint using the spray paint version. My question is do I have to seal it with wax? And if yes or no, can I use the item right away, I have been reading up on it and I get conflicting reports lolol some say to let the piece cure for 3 weeks. P.S. You may recall I wanted to chalk paint months ago but now I am ready!!!!! 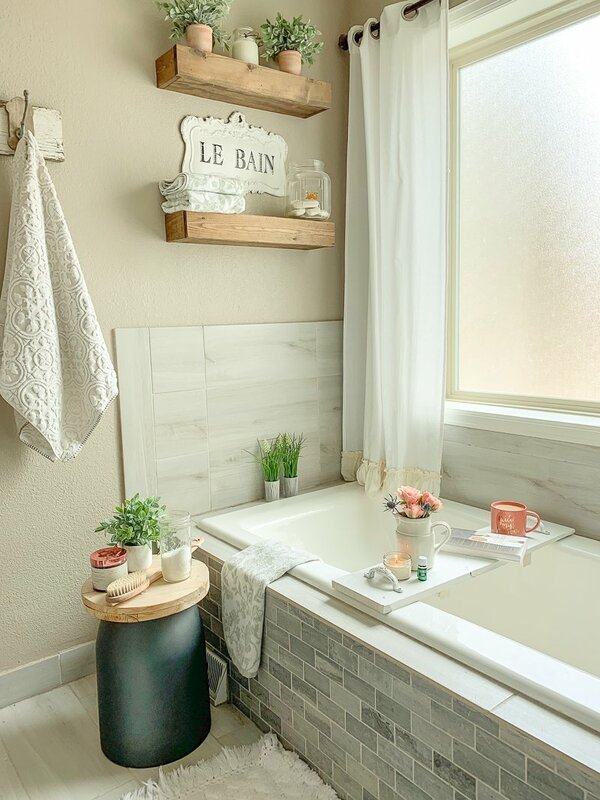 I love the little bathtub tray. 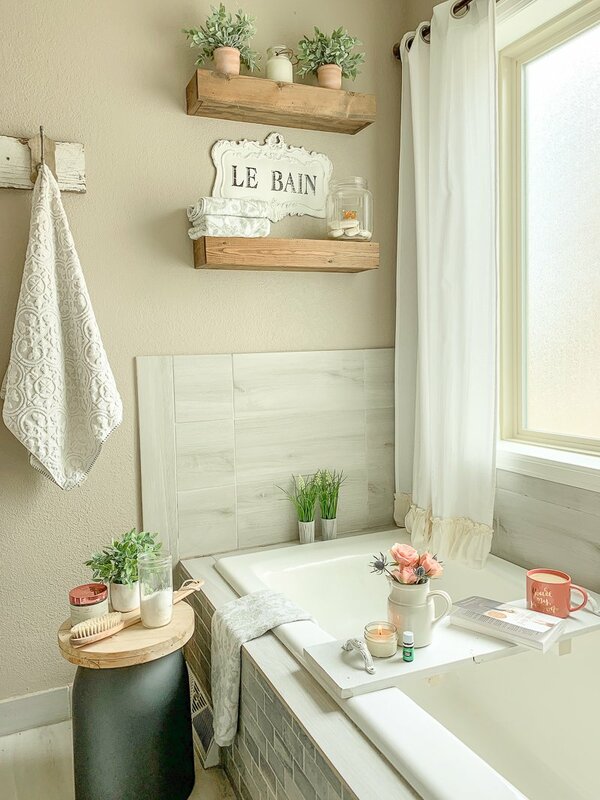 So simple but it looks perfect with your tub. Sarah! Are you loving that book? I sure did!! And I love your cute little bath spa! Yesssss! loved the book so much! Luv the tile floor & wall tile. Where did u get that tile & brand name? Both you diys are beautiful!! Thanks Susie, we got it form a local shop on clearance. On the floor it’s tile that is meant to look like wood, but I can’t remember the name. 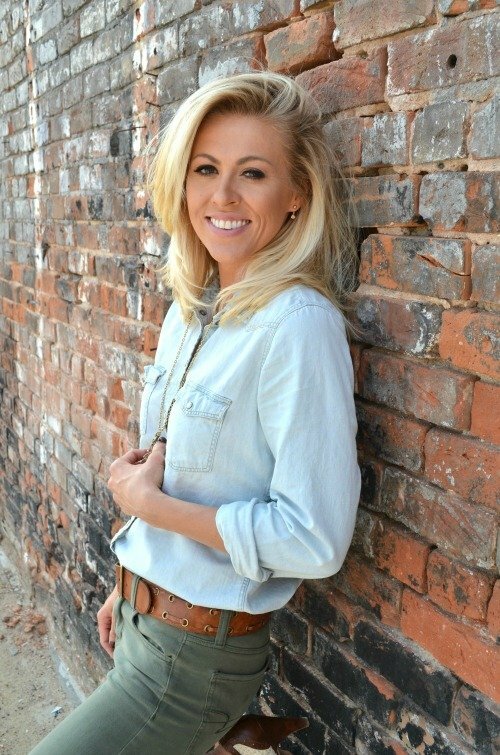 Love your blog and great affordable ideas! Why anyone would let Trading Spaces into their homes is beyond me! I can’t watch that show any more because of all the horrible designs they do, to bad. RIGHT?! I felt bad for the people. They tried to act ok with it but you inside they’re dying. Craziness!! Love it. I have always wanted one of these. So simple but so clever…. Gorgeous spa like bathroom. Love it! 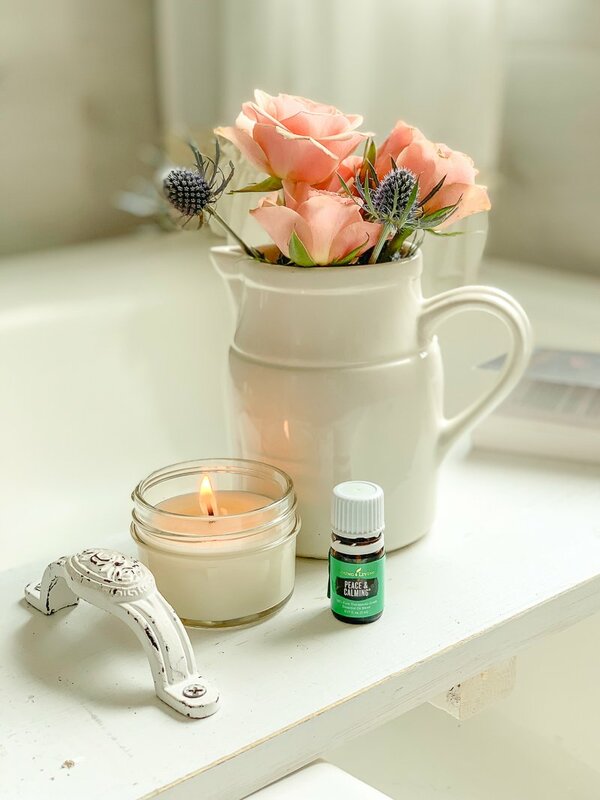 And Peace and Calming is my #2 fave YL oil. Also, Trading Spaces. It’s not even fun to watch when they do that crap. Hildi just wants the shock factor & totally forgot that was their MASTER BEDROOM!! And that flooring is going to be really hard to tear out. right?! That show is just scary now. I used to love it but eeesh! I love the stand beside the tub! Something like that would be perfect in my small bathroom. Any ideas? Thanks Felicity, it’s from Marshall’s! Hello Sarah, That’s quite an interesting project, Love the sign!